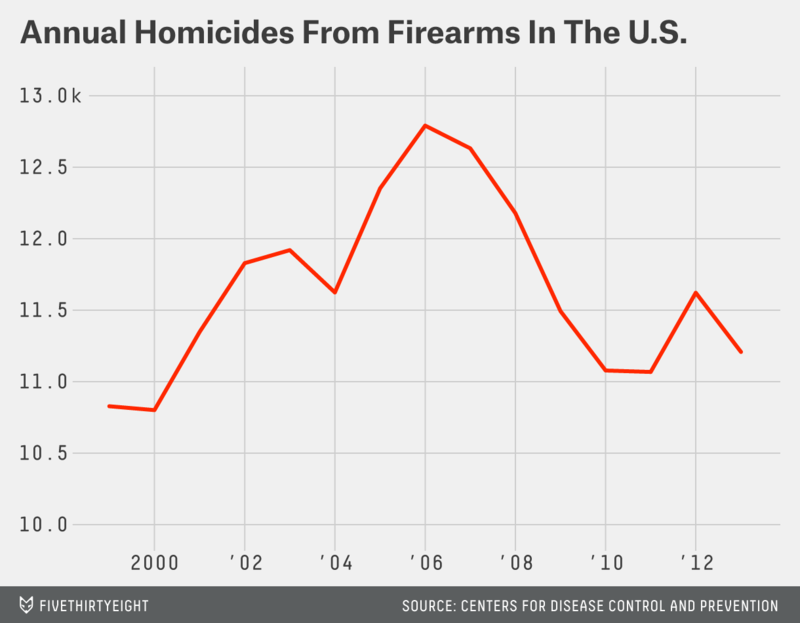 But overall gun homicides have declined. The shooting that killed at least 14 people at the Inland Regional Center in San Bernardino, California, on Wednesday is the deadliest mass shooting in the U.S. this year but far from the first. It wasn’t even the first to occur on Wednesday. A shooting early in the morning in Savannah, Georgia, killed one person and injured three others. 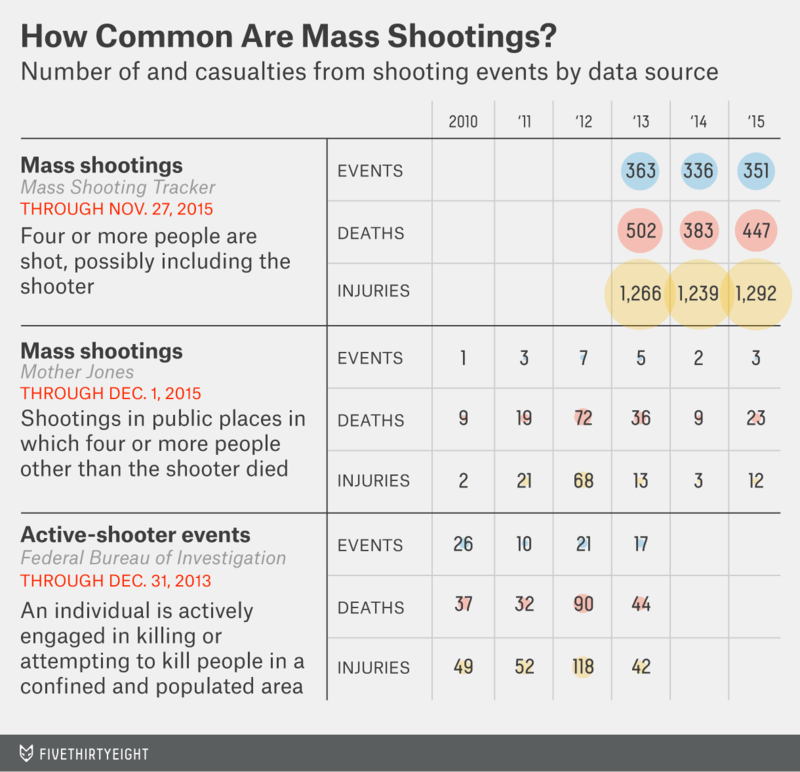 What qualifies as a mass shooting depends on who is counting. 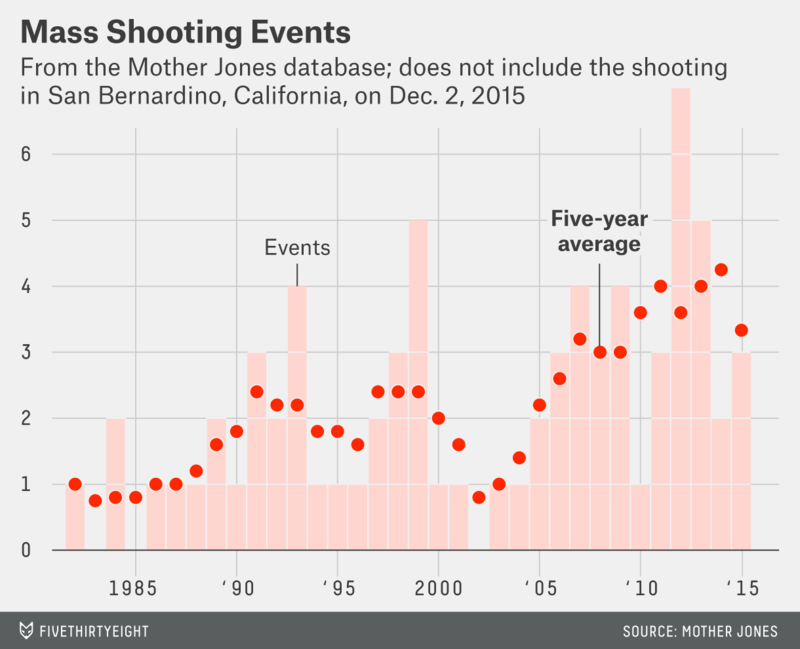 By at least two measures, mass shootings have become more common. We looked at three often-cited data sources and compared their definitions and counts. In 2013, users of the social commenting site Reddit created a crowd-sourced tracker of mass shootings that isn’t restricted to fatal incidents; it covers cases in which at least four people were injured or killed, potentially including the shooter. Because of this broad definition, the Mass Shooting Tracker data set is the largest of these three. But since the data only goes back to the beginning of 2013, it doesn’t offer any insight into long-term trends. Mother Jones magazine gathered data on mass shootings for a 2012 investigation and has continued to update its list, counting 72 incidents from 1982 through Tuesday. The magazine uses relatively strict criteria — the incidents must occur in public places and can’t involve gangs or robbery. The primary motive must be mass murder. Also, Mother Jones excludes incidents in which the shooter killed three people or fewer — meaning that its count doesn’t include the shooting at a Colorado Springs Planned Parenthood clinic last week that killed three people. Events that fit the criteria are rare — the high in a single year was seven, in 2012. That means single large events have a big impact on the data, making it noisy. But the long-term trend is clear: There have been more total mass shooting incidents and deaths in the 11 years starting with 2005 than there were in the previous 23 years combined. The shooting in San Bernardino on Wednesday was also labeled as an “active shooter” incident. The FBI defines an active-shooter incident as an individual or individuals “actively engaged in killing or attempting to kill people in a confined and populated area.” The agency counted 160 such incidents from 2000 to 2013 in which a total of 557 people were wounded and 486 killed. 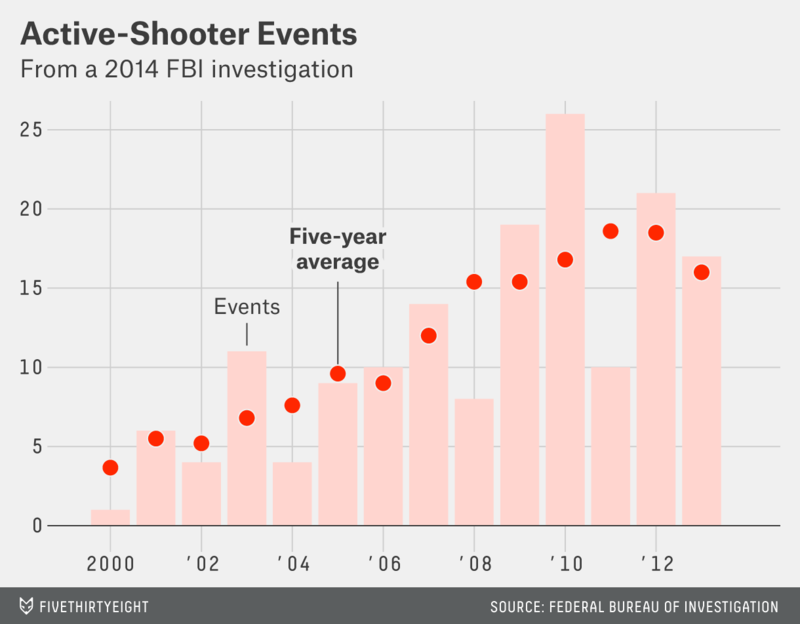 And the FBI found that these shootings were on the rise: There were 115 active-shooter incidents in the last seven years of the data set, up from 45 in the first seven years. However mass shootings are defined, the deaths they cause represent a small proportion of all homicides committed with firearms in the U.S., which have declined from a decade ago, as has the overall murder rate, according to the Centers for Disease Control and Prevention. This story has been updated to include charts showing the full range of available data from Mother Jones’s mass shootings data set and the FBI’s active-shooter data set.